1. To read the article in the Border Crossing newsletter click here and go to page 13. The article is also reprinted below. The origin of the “222 DRAW” fundraiser is lost in time, but oral tradition says it came from a Saskatchewan* Lions club and became a feature of the Mayne Island Lions labor Day Salmon Barbecue. Every year, 222 raffle tickets are sold at $20 each, raising $4,440. A white board is set up at the BBQ with all 222 names of the ticket holders, so everyone knows who bought tickets to support the Lions. As the crowd munches BBQ, tickets for twelve prizes are drawn. The lowest is only twenty-five dollars, but as the day wears on, the prizes increase in value, reaching $800; $1,600 in prizes, leaving $2,840, to go directly to a worthy cause. Two years ago, these funds went to improve the playground at the Mayne Island School. Last year’s proceeds are helping to build a surfaced bicycle path from the ferry landing to the town center. This year the worthy cause will be the island’s old, one-room school house that was replaced by the present Mayne Island School a generation ago. The Mayne Island Volunteer Firemen’s Association has saved it and is restoring it for use as its club house and a meeting place for various community events that the Firemen’s Association will provide without charge to non-profit groups. The “Old Schoolhouse”, a small rectangular wooden building held together by hand-forged nails, was constructed in 1894 for $624. 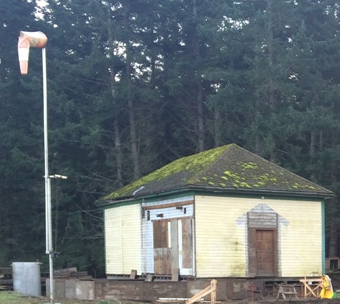 It replaced a smaller structure built ten years earlier, which housed Mayne Island’s first educational institution. It was too small right from the beginning and was soon replaced by the “Old Schoolhouse” that was in use until 1950, when it was replaced by the nucleus of our present school. The Old Schoolhouse was taken over by the fire department, who moved it in 1966 to stand in its present location near the current fire hall. After fire destroyed the social center called “Neighborhood House”, the teenage group that met there was given the Old Schoolhouse. Now the fire hall is being remodeled and the Old Schoolhouse must be moved to a new location. It is being remodeled to make it more useful to the community. This year’s 222 funds will go towards this project. The concept of the 222 DRAW is an excellent budgeting vehicle. It produces the same amount of money each year and can be allocated to projects in the planning stages that will only require funding in two or three years time. This is very useful to community planners and also very useful to the Mayne Island Lions Club, since it attracts sustained, continual interest in club activities. *Editor’s note: Lions Wilderness Experience, a Lions MD5 special needs camp in northern Saskatchewan, is located at Km 222 on Highway 106. It is possible that 222s are an old fundraising concept first developed to support this program.